We are moving toward the end of the first quarter so let’s take a look at how the Blackhawk Real Estate Market performed for the first two months of this year versus 2011. As you can see the number of homes sold has dropped off from last year and pricing has increased slightly. 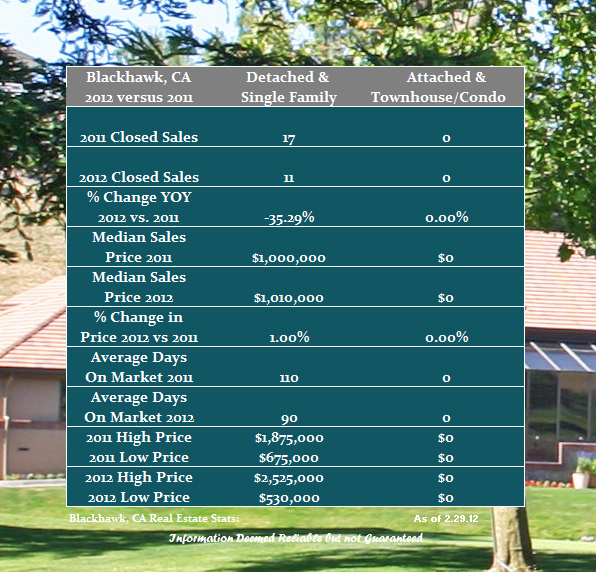 It is tough to make any conclusions at this point in the year as the data sample for Blackhawk Country Club is small but what I am hearing is echoing many of the local markets….inventory is lacking. Stay tuned for the full first quarter report for 2102 in early April. Share the post "Blackhawk Country Club Real Estate Update for February"